Filomeno Aguilar is Professor of History and former Dean of the School of Social Sciences, Ateneo de Manila University. Since 2003 he has been chief editor of Philippine Studies: Historical and Ethnographic Viewpoints. He is the current Chair of the Technical Panel on General Education, Commission on Higher Education. He obtained his PhD degree from Cornell University in 1992, for which he received the Lauriston Sharp Prize from the Cornell Southeast Asia Program. Prior to repatriation in 2003, he taught at the National University of Singapore (1993–1996) and James Cook University (1996–2003). 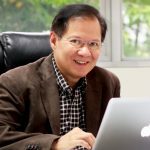 He has served as President of the International Association of Historians of Asia (IAHA, 2005–2006) and Chair of the Philippine Social Science Council (PSSC, 2006–2008). He is on the editorial advisory boards of Southeast Asian Studies, Journal of Current Southeast Asian Affairs, Inter-Asia Cultural Studies, and the Journal of Agrarian Change. His books include Clash of Spirits: The History of Power and Sugar Planter Hegemony on a Visayan Island (University of Hawaii Press, 1998), Maalwang Buhay: Family, Overseas Migration, and Cultures of Relatedness in Barangay Paraiso (Ateneo de Manila University Press, 2009), and Migration Revolution: Philippine Nationhood and Class Relations in a Globalized Age (NUS Press and Kyoto University Press, 2014).